I have a very old house with plaster walls. 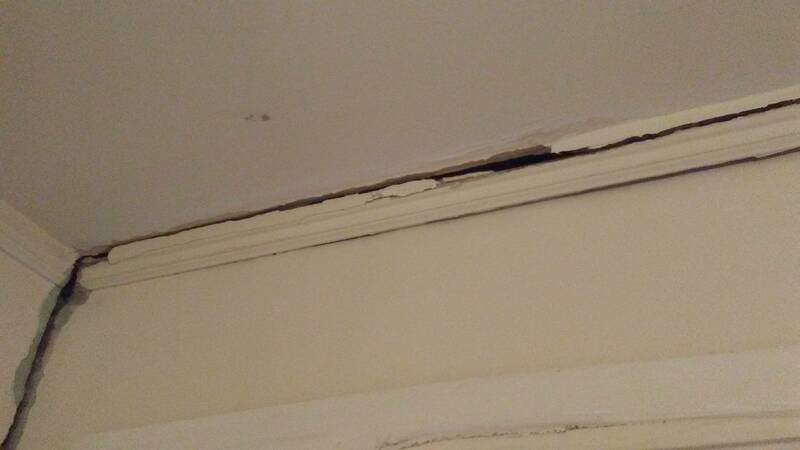 After getting a new roof, a large crack opened up between the molding and the ceiling where the wall is pulling away, but only along the one outside wall. The rest of the walls are fine. The molding used to be a picture rail but a previous owner filled in the 1/2" gap between the molding and the ceiling; that is where it's cracked and the old plaster is falling out. The crack going down the side I can fix, but I'm not sure how to deal with the missing molding in the corner there. I really don't want to remove and replace all the molding. Any suggestions on fixing? I really don't want to remove and replace all the molding. Any suggestions on fixing? If the crack has stopped growing and the wall is stable, you could just remove any loose plaster/filler, apply new filler and repaint. You'd need a "deep crack" filler. If the crack is still growing and is as large as it looks, you have a more urgent and more important problem needing professional help. Not the answer you're looking for? Browse other questions tagged repair plaster trim crack or ask your own question. Are cracks on exterior walls serious and can I fix them myself? What considerations do I need to make when mounting heavy objects on plaster walls? How can I make an expansion joint in plaster?